Taekwondo is one of the most systematic and scientific Korean traditional martial arts that teaches more than physical fighting skills. It is a discipline that shows ways of enhancing our spirit and life through training our body and mind. Taekwondo is aimed at people who like a challenge and want to improve themselves everyday. Taking the first step to a better, healthier life is as easy as grabbing a bottle of water and coming down to the club for your first free session! 2016 Gained his 6th Dan in JUJITSU. 2014 Became a co-instructor in Premier Taekwondo Academy. 2014 Instructor certificate from British Taekwondo federation. 2014 Qualified as a first class instructor under the supervision of GEORGIAN TAEKWONDO FEDERATION. 2014 Participate in technical seminar by the British Taekwondo technical team. 2013 Gained his 6th Dan in Taekwondo. 2012 club achieved a 1st place in Armenia open championship. 2011-2014 Trained in self-defence against knife and guns under the instruction of Master MIKADZE in GEORGIA for JUJITSU. 2010 Achieved a first place in a joint clubs under the name Caucasus countries open cup. 2008 Achieved a first club place under the name Caucasus countries championship. 2002 Qualified as a third class referee under the supervision of I.R.IRAN TAEKWONDO FEDERATION. 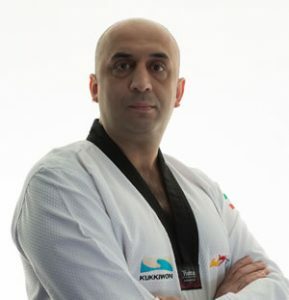 2001 Qualified as First class instructor under the supervision of I.R.IRAN TAEKWONDO FEDERATION. 2000 became the official Taekwondo instructor of Military services in Special forces. Training soldier’s personal self- defence against knife and gun attacks. 1999 Qualified as a referee under the supervision of I.R.IRAN TAEKWONDO FEDERATION. 1998 Became a co-instructor in Tehran Club. 1997 Gained his 2nd Dan. 1996 Gained his 1st Dan. 1994 Achieved 1st place in student championship TEHRAN province. 1994–1996 many different medals and trophies from national and international competitions in kyorogi. 1990 – 1993 achieved 2nd position in under 16’s championship in I.R.IRAN. 1985 Starts practicing Taekwondo at the age of 7, under watch full eyes in his home town TEHRAN.